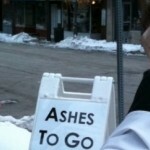 Christopher L. Webber » Blog Archive » Ashes to Go? (Jesus said), “And whenever you pray, do not be like the hypocrites; for they love to stand and pray in the synagogues and at the street corners, so that they may be seen by others. Truly I tell you, they have received their reward. But whenever you pray, go into your room and shut the door and pray to your Father who is in secret; and your Father who sees in secret will reward you. And whenever you fast, do not look dismal, like the hypocrites, for they disfigure their faces so as to show others that they are fasting. Truly I tell you, they have received their reward. So what do we have? Clergy standing on street corners where they may be seen by others disfiguring by-passers faces so they may appear to others to be fasting! Can someone explain this to me? Auctor, your comment on apparent conflict with ATG and the readings for Ash Wednesday has become even more of a quandary for me lately, since I was asked if I would be interested in participating in administering Ash Wednesday ashes at a major railroad station in the northeast. Quandary, for I have been charged in the past with evangelic literalism in interpreting the Matthean gospel by placing bowls of water and towels at church doors for those who wish to wash their faces (no obligation) on the way out. if we are invited to impose ashes on those of the public who wish to receive them, how are we to at least indicate–by signage or verbally– that there even is a tension between a symbol custom beloved of SOME CHRISTIANS and the deeper demands of the Gospel? In a country that officially rejects religious establishment, who gets to go public with visual symbols and who doesn’t? And, finally, who explains and/or interprets Ashes To Go on a crowded sidewalk or in a large public room, to people in a hurry? I was grateful for this priest’s comments: http://stlukeandstmatthew.org/ashes-to-go-or-not-to-go-that-seems-to-be-the-question. He speaks my mind about the whole “Ashes to Go” phenomenon.